This month we added tools to help troops move their data from Troopmaster's web-based software, TM Web 2.0. TM Web 2.0 allows you to export a CSV file containing all of your scouts, their parents, and other adult leaders. This file can be uploaded into TroopWebHost to populate your membership table. User IDs and passwords will be created at the same time. You'll find this function at Membership → Upload Members → Upload Members From TM Web 2.0, as shown below. 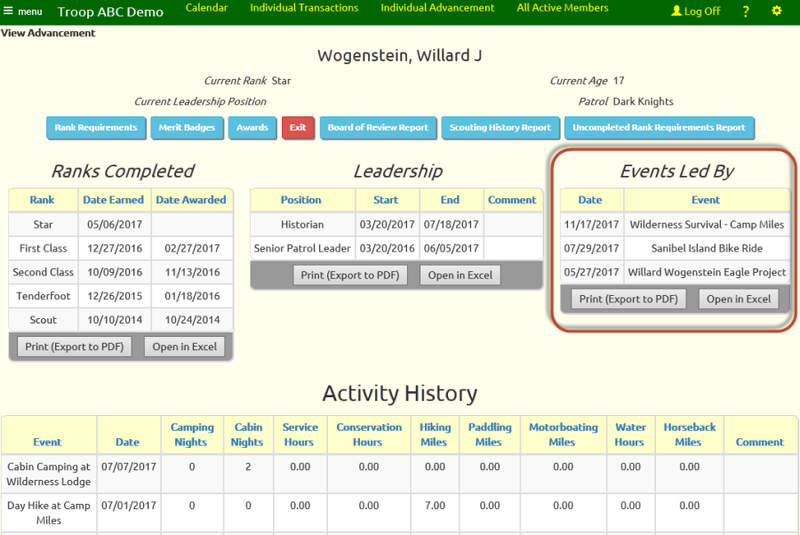 TM Web 2.0 produces a PDF report that summarizes each scout's rank advancement, merit badges, awards, leadership history, and training. This can be imported into TroopWebHost by going to Advancement → Upload Advancement → Upload Individual History PDF from TM Web 2.0, as shown below. TM Web 2.0 produces a PDF report that summarizes each scout's participation in troop activities. This credit can be transferred into TroopWebHost by going to Advancement → Upload Advancement → Upload Individual Participation PDF from TM Web 2.0, as shown below. These badges are available now in TroopWebHostGS. The language for requirement 1.a for 2nd Class and 1st Class was broadened to count some outdoor activities that do not involve camping. Since this represented a loosening of the requirement, we incorporated this change into the current version of these ranks rather than creating new versions. We did create new versions of the first six Eagle Palms to implement the changes that will take effect on August 1, 2017. As of that date, a board of review is no longer required for each Eagle Palm, and scouts who have 26 or more badges at the time of their Eagle board of review may now be awarded the corresponding Eagle Palms simultaneously with their Eagle Scout rank. If you've configured your event types to enable event leaders, then you can select scouts to lead those events. You can now view all of the events on which a scout has been designated as a leader from the View Advancement page. The Rank Summary tab now contains an "Events Led By" section. This section will only appear for scouts who have led at least one event. If you've set up a fundraising sales campaign to allow the public to purchase items on-line from the ScoutSales.org site, you will probably end up with some incomplete orders. This is usually because the customer failed to complete payment after initiating the order. But there can be orders for which payment was completed that don't get posted properly, most likely because of an error in your PayPal settings. You can view these orders from the new Incomplete Internet Orders page, as shown below. Once you've confirmed that you've received payment for one of these orders, you can convert it to "completed" status by pressing the Payment button. This will take you to a page where you can create a transaction for this payment.